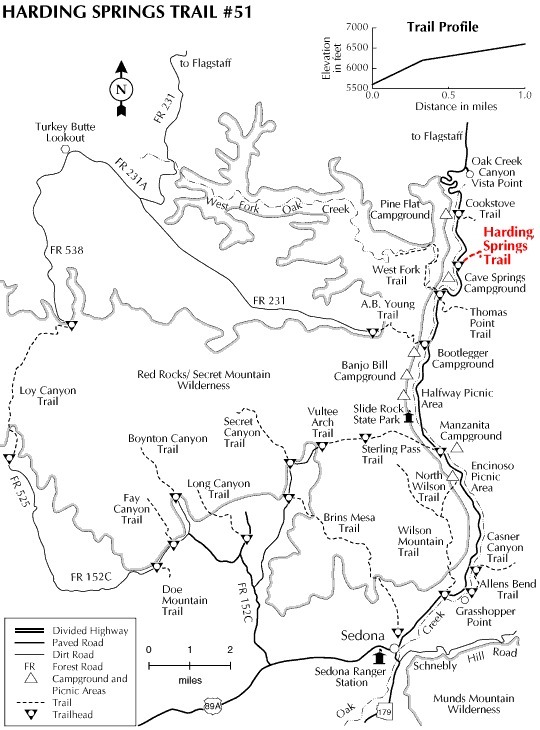 Harding Springs Trail is named after a settler that occupied the area long ago. I 'm not sure "spring" is appropriate as you don't pass a spring on this trail. It's a general reference to the trail taking off "near" a spring. Cave Spring is located across 89A in the campground. The trail takes off north of the campgrounds and across 89A. Now it takes off directly across a Red Rock Pass purchasing station. Parking is not permitted at the station. It's a fairly steep trail. Several books state this trail is comparable to the Cookstove Trail. I guess so, but this one seems a tad easier because it's smooth. The Cookstove Trail has a few steep sections, which seems more arduous. The trail takes off and quickly makes a switchback. It soon goes under a power or telephone line and keeps going up. The next switchback is a lot further than expected. I was beginning to wonder if this trail went to the rim or just over to Cookstove. Indeed, the rim is reached further on after a couple more switchbacks. The second noticeable switchback is one you don't want to miss. The trail turns right just before falling off the edge of a cliff. Next comes a large log-rail. There's a similar rail on the Cookstove Trail. None of which seem needed by any means. It's not that much steeper here than the rest of the trail. Maybe it's for tying up horses to rest, but I don't know that for a fact. Although it's a Hard"e" hike it's short and over soon. The trail breaks onto the rim with little excitement. Views aren't great from here, just a bunch of trees. Don't get me wrong, the trees are nice. There just aren't good distant views. Continue on a ways over and to the right to a lookout. The book Sedona Hikes states that views from atop this trail are better than the Cookstove. I'll disagree. I enjoyed the Cookstove Trail much more. The views along the way and atop blow away this trail in my opinion. Once on the rim you can head across on the HC Rim Trail. 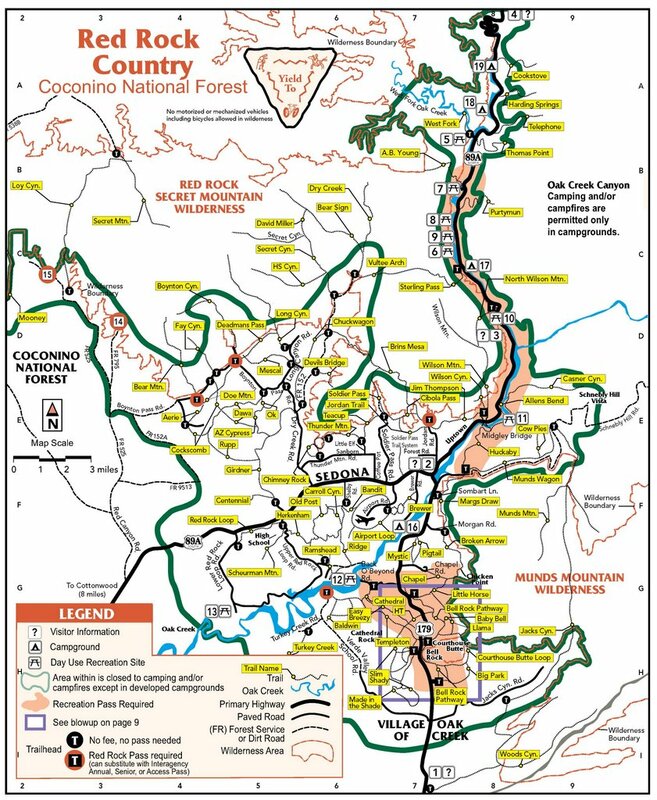 Coconino FS Reports This trail originally was one of several that provided a way for cattlemen to drive their stock in and out of Oak Creek Canyon. For today's hiker, that means it's wider than most Oak Creek Canyon trails and not as steep as some. So, if you're looking for a gradual climb to the canyon rim, complete with rest stops along the way where you can enjoy the view both up and down canyon, you've found it. From the Sedona 'Y' ( 179/89A ) go East (what seems like North) on 89A 11.5 miles to the far north end of Cave Springs Campgrounds. Do not park in the campgrounds, it cost too much. You do need a Red Rock Pass to park alongside 89A. There are several sections along the west side the road where you can park. There is a Red Rock Pass purchasing station directly across the highway from the trailhead. Extended parking (more then buying your pass) at the station is not permitted. The trailhead is on the east side of 89A. Location: 17 miles south of Flagstaff (10 miles north of Sedona) on paved roads in scenic Oak Creek Canyon. Access: Drive 17 miles south of Flagstaff or north 10 miles from Sedona to the entrance to Cave Springs Campground at about milepost 385.5. The Harding Springs trailhead is on the east side of the highway. Be careful to take the trail that leads uphill. The other one doesn't go much of anywhere.